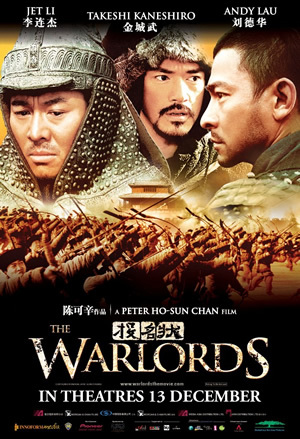 Warlords is a great movie. Far, far better than I expected. Not the usual at all. A wonderful example of Chinese cinema. Gorgeous opulent pictures, a heartbreaking, thoughtful story, epic battle scenes, amazing landscapes, a very special atmosphere, poetical in tone, complex relationships and an excellent cast. Jet Li surprised me completely. I would never have expected him to be capable of such nuanced acting. Andy Lau and Takeshi Kaneshiro are superb as well and so is Jinglei Xu as Lian. Set in 19th century China during the Taiping rebellion Warlords follows the destiny of General Pang (Jet Li). He is the only survivor of his unit ( thanks to a shameful act). All the others have been massacred. He finds refuge in the mountains among bandits and convinces their chief and his brother to follow him and become soldiers. The three men who feel a very close bond early on take an oath to live and die for one another. We soon follow them from battlefield to battlefield. Pang seems to have the highest moral standards that he manages to keep up even though they are constantly at war. But the longer the war lasts, the more it gets difficult for him to live up to these standards. Finally, in order to do a greater good, as he says, he is willing to commit what one of the brothers sees as a crime. What started as a close friendship turns into the opposite developing a destructive dynamic. The core message of this film seems to be: War is ultimately ugly and nothing good can come out of it. Warlords is really a story of Shakespearian proportions. It did also remind me of Greek tragedies. Only much darker. And still it is a compellingly beautiful movie. Large scale cinema at its very best. I will definitely watch it again.